Patna, April 7 (IANS) Lok Janshakti Party chief and Union Minister Ram Vilas Paswan on Sunday claimed that a National Democratic Alliance (NDA) "wave" is sweeping the country and the Narendra Modi government would easily come retain power. "It is certain that Narendra Modi would become Prime Minister again as people have made their mind to support and vote the NDA to power. NDA would win all 40 Lok Sabha seats of Bihar and more than 350 across the country," he told media after releasing his party's manifesto here. "It is more or less certain that NDA government would be formed. Only the formality remains." Paswan said that his party manifesto promised the right to work to deal with the major problem of unemployment in the country. He said that the LJP has demanded strict action against violence in the name of cow protection as well as harsh punishment for those found guilty in cases of lynching. 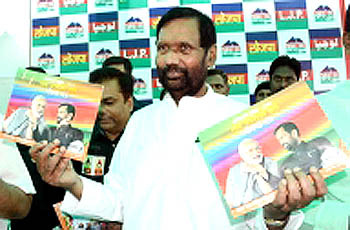 The LJP also promised stern action against those spreading hatred and communal propaganda. The party is contesting from 6 seats in Bihar as per the NDA seat-sharing formula, with the BJP and JD-U fighting from 17 seats each.